Have you ever dreamed of boarding a ship bound for the perfect destination? Now imagine how you would feel about that same trip after finding a cruise price reduction of 65%. It isn’t just a dream anymore. Thanks to the innovative team at ccruisewatch.com, you can find a cruise price reduction to nearly any destination. Our site, a cutting-edge search engine that matches customers with cruises, recently released a report showing that the average cruise price reduction is 16%. The same report indicates that shoppers can find discounts of as much as 65%, if they use the right booking tool. We regularly publish cruise evaluations, but have gone the extra mile to prepare an analysis of all cruises for the year. 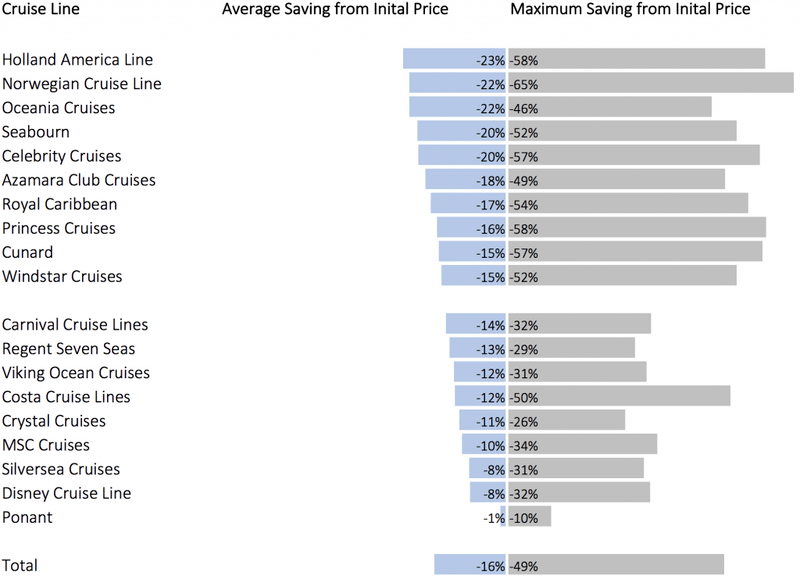 This analysis uses more than 6,000,000 data points to evaluate the average and maximum price reductions each cruise company has offered during a booking period. The results are astonishing! The cruise companies use extremely different pricing strategies. Cruise companies can be divided into two groups. The first group has very flexible prices, while the other group offers more stable pricing. The cruise lines with flexible pricing quickly react to changing market situations. This flexibility allows them to balance supply and demand easily. It also allows them to offer great cruise price reductions! The cruise lines with the more steady pricing model prioritize stable and reliable fares. This pricing model prevents them from offering large price reductions on their cruises. Holland America Line leads the group with very flexible prices. Holland America offers an average 23% savings over the initial price. Fortunately, sharp bargain hunters can find a near 60% cruise price reduction. Norwegian Cruise Line, Royal Caribbean, Princess, and Seabourn are other cruise lines that are pursuing a similar pricing strategy. Carnival Cruise Line heads the group that pursues a more stable pricing model. Other major cruise lines like Costa and MSC also use a more stable pricing model, but occasionally offer last minute discounts. Carnival Cruise Line offers an average 13% savings, but will offer a cruise price reduction of 32% at times. Ponant, a smaller cruise line, frequently offers discounted cabins, but tends to wait until shortly before departure to offer a cruise price reduction. We offer consumers free price drop monitoring. Our website processes massive amounts of data using intuitive software that will help consumers find the perfect cruise: at the right time, at the best price. Users can receive automatic alerts when prices are reduced or when good deals are on the horizon. A price forecast is built into the website. “Cruise lines invest massive amounts of resources into revenue optimization. We are leveling the playing field and offering consumers up-to-date technology to make the right decisions,” says Cruisewatch’s co-founder. We are doing this to honor our motto: RIGHT CRUISE. RIGHT TIME. RIGHT PRICE. You can find more valuable resources on our website. For instance, have you ever wondered if it is cheaper to go on a cruise than to have a stay-at-home vacation? You can find the answer here. Consumers often wonder how far in advance to book their cruises. We answered that question in this blog post. Surprisingly, there is one day of the week when you can find the best prices on cruise tickets. Find out which day it is by reading this post.